Favorite activity: Playing with his pals Amika and Kelsey. 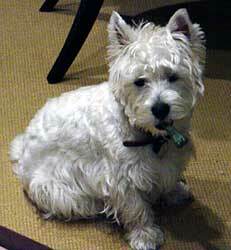 Special talents: Cutest Westie on the planet. Most embarrassing moment: Freaked out when taking a picture on Santa's lap. Most trouble I ever got into: Jumped on dining room table (with dinner on the table). My favorite friends: Amika, Kelsey, and Puddles. Biggest adventure: Hanging out at Aunt Trish's house with the two beagles and Amika.